That was the underlying message of the Art Competition for autistic and underprivileged children held on the 24th of March in remembrance of our Independence Day at the Mastermind school premises. It was not the brightest of days, perhaps; a warm, slightly cloudy day with the occasional refreshing breeze. But the open courtyard, with the rare view of the blue-grey sky provided the perfect mood for one who was willing to paint. The busy organizers (Mastermind Community Service Club) rushed around, arranging tables and chairs and registering a mass of children. Many were dressed in school uniforms, some were in plain clothes. Though their uniforms were ragged, their excitement and enthusiasm was infectious. They were split into three sections. “Ko” section consisted of Autistic children, who were asked to draw whatever they felt like drawing. 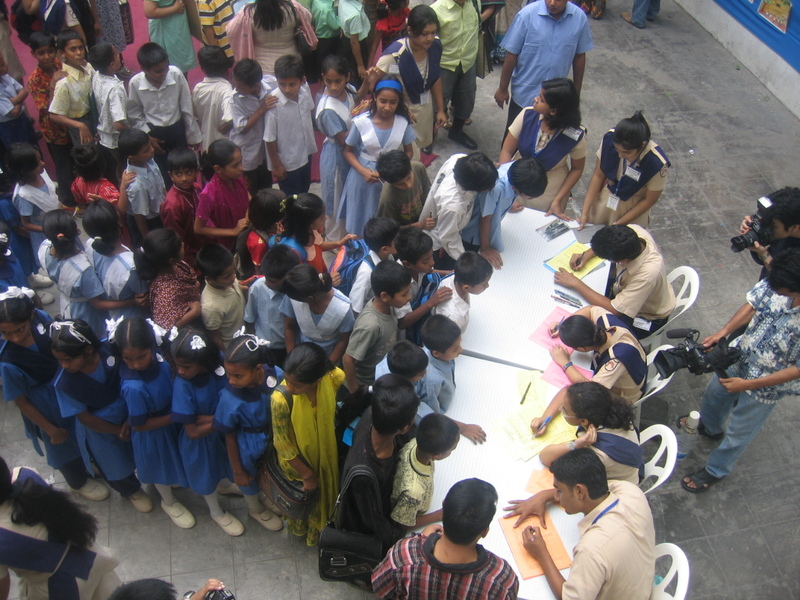 “Kho” section consisted of underprivileged children studying in various NGO-run schools. It was for kids from Nursery to class III. 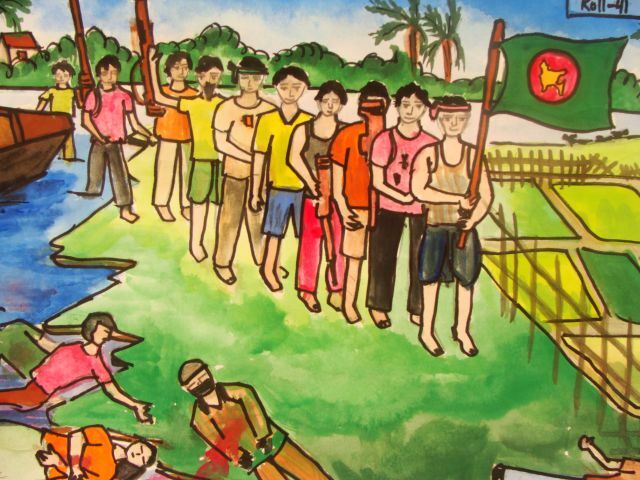 They were drawing under the title “Amar chokhe Bangladesh”. “Gho” section was for the ones in Class IV and above. Their topic was “Shadhinota Andolon”. And boy, these kids can draw! This poor, artistically challenged reporter walked through their ranks cowed by their imagination and talent. For example, a girl was painting an image of five suns. Two were yellow, one was green, one brown and one blue. Isaac Asimov wrote in Nightfall about a world with six suns. Who says autistic children are mentally challenged?! Aadit from SWAC drew a better tree than I ever would have managed. He is a student of class III and as he proudly declared, his classroom is on “tin tala”. In fact, most of the children seemed so busy, it felt sacrilegious to stop their work and talk to them. Once some of them were finished, talking seemed like an option. Parvez, a student of class four, who had an uncanny similarity with Nolok Babu, said his favourite subjects were English and Bangla. He is a student of Pollobi Model School. English was a common subject, as Sanjida Sony, a student of class II from Ekmatra, graciously said she liked it best as well. She was on her way to get her blood group tested. ‘Don’t get scared now,’ I winked, and she gave me a toothy grin. That was about the time the clowns made an appearance. Students wearing pointy hats, clown noses and mantles came out and put on quite a show. “Some people are saying we are lame clowns,” one of them said in an undertone to the other. That’s not true. The kids loved you guys and in the end, that’s what matters: you made them smile. Speaking of shows, we must not forget the mini concert that took place during the competition. Many of the children had absolutely no fear when it came to singing in front of a crowd. Cheered on by the mass of students, parents and their peers, they performed numbers such as Jodi tor dak shune keu na ashe and Krishno with great enthusiasm. I personally liked the cover of Dakatia Bashi. How many of us would have had that much guts? After the Art competition, while the judges were…well, judging, the kids also got their faces painted by the students. The hip thing was to get one’s name painted along with the flag or butterflies or flowers and leaves. ‘Nice name,’ I said to Ridoy, a student of class II. He looked a little confused and then understood and smiled. He said he is enjoying himself. And it seemed everybody was. Cheeks and foreheads a-blaze with colours, sipping their cokes or eating their chocolates, they walked around talking, checking out the card sale, looking at the art exhibition by Mastermind students of class VI and VII and taking group pictures with their teachers. Occasionally a few of them jumped when a balloon popped nearby. My hat’s off to the organizers for such a wonderful event. For a group students, you guys have done a great job. The participating organizations, AWF, Caring Glory, SEID, SWAC, Ekmatra, Afzalunnesa Foundation and Uttoron played a vital role in the event. The administration, specially, the principal, Syed Fakhruddin Ahmed, and the Vice-principal and ECA-in-charge, Nina Huq must also be mentioned, for encouraging their students to organize events such as these. There was a prize giving ceremony at the end. But as I clapped with the rest as the names were announced and the gifts given, I felt the real prize were those smiles and the infectious joy that filled the air. The spirit of freedom has evolved far beyond what we sought in our War of Independence in 1971. Freedom in the modern world symbolizes more than just the liberty of choice or expression. Freedom defines our rights, equality in society and the creation of opportunities for everyone. In pursuit of this freedom and in remembrance of our glorious Independence Day, the Mastermind Community Service Club (MMCSC) organized an art competition for the underprivileged and autistic. On the 24th of March 2008, the premises of Mastermind Senior Section was in a frenzy of activity with the colour of balloons, posters, and children. Art is symbiotic with the freedom of expression and as the brushes stroked colours of liberty, our theories were not proven wrong. The event commenced at 3:30 PM, with the lengthy registration of the participants. The participating organizations were Autism Welfare Foundation (AWF), Caring Glory, SEID, SWAC, Ekmatra, Afzalunnesa Foundation and Uttoron. Each of these institutions has played an incredible role in catering to the needs of those less fortunate than us, and we salute their selfless dedication. The inauguration (with the huge flying balloons which you might have seen around Dhanmondi) by the chief guest, Mr. Syed Fakhruddin Ahmed (Principal of Mastermind School) and the participating children took place around 4:00 PM. Finally, at the end of the speeches, the art competition started around 4:30 PM. The children were divided into three groups: Group A – Autistic children (Ja Icche Tai Aki), Group B – Nursery to Class III (Amar Chokhe Bangladesh) and Group C – Class IV onwards (Shadhinota Andolon). The hour that followed was filled the mayhem of the young and eager painters. An extra dimension was imbued into to the atmosphere by the budding musicians of Group A and their solo performances. The scene of hysteria was completed by the overworked volunteers running around trying to find clipboards, erasers, paint and brushes. After an hour of drawing, colouring and scrutinizing, the competition drew to a close. 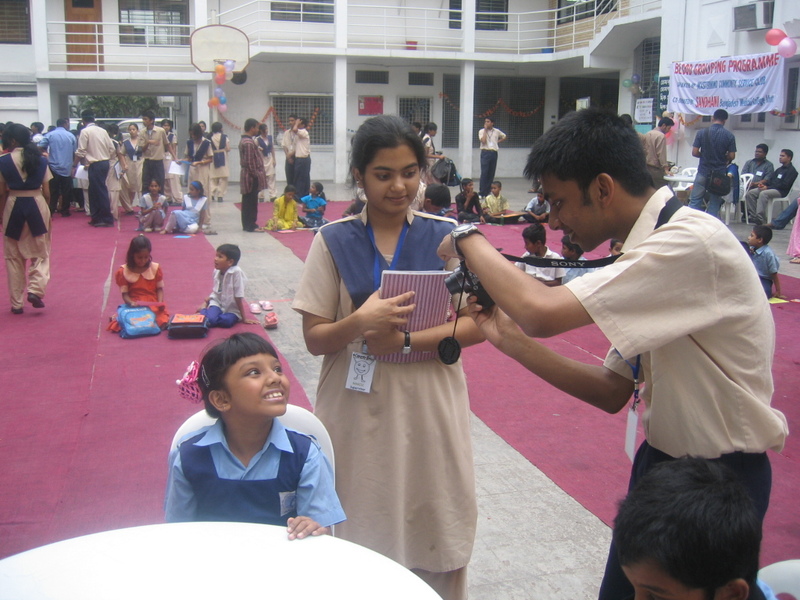 Chips, drinks and chocolates were distributed to the participants, their representatives and the teachers. The pieces of art were collected to be judged by Mr. Bikash Haldar, Ms. Nishat Jahan and Ms. Asilatul Afra (teachers from Mastermind) in the half an hour that followed. During this interval, Shandhani from Bangladesh Medical College and Hospital conducted free blood grouping for everyone interested. Against a backdrop of an art exhibition by Classes VI and VII of Mastermind School, face painting and clown performances were held. Balloons were burst, posters were torn and general chaos was rampant. The event culminated to its apex with the much anticipated prize giving ceremony. Awards were given out by the chief guest amidst the loud cheers and applaud of the audience. Adil Haque (SWAC), Abeer (AWF) and Nabi Hossain (SWAC) won first, second and third prizes from Group A respectively. Josna, Poli and Sonya from Ekmatra were winners from Group B; while Abul Kalam Azad, Labiba and Azmain Ikthidar picked awards from Group C.
The event was ended by a speech from Project Leader Sabhanaz Rashid Diya that received a standing ovation (and many catcalls) from the crowd. Though the event was over around 6:00, volunteers could be seen on campus long after, busily clearing out. MMCSC is indebted to Mr. Syed Fakhruddin Ahmed, Ms. Neera Habib (Director, Administration) and Ms. Nina Huq (Vice Principal and ECA-in-Charge) for their constant support and enthusiasm. Without their encouragement, this event would not have been possible. 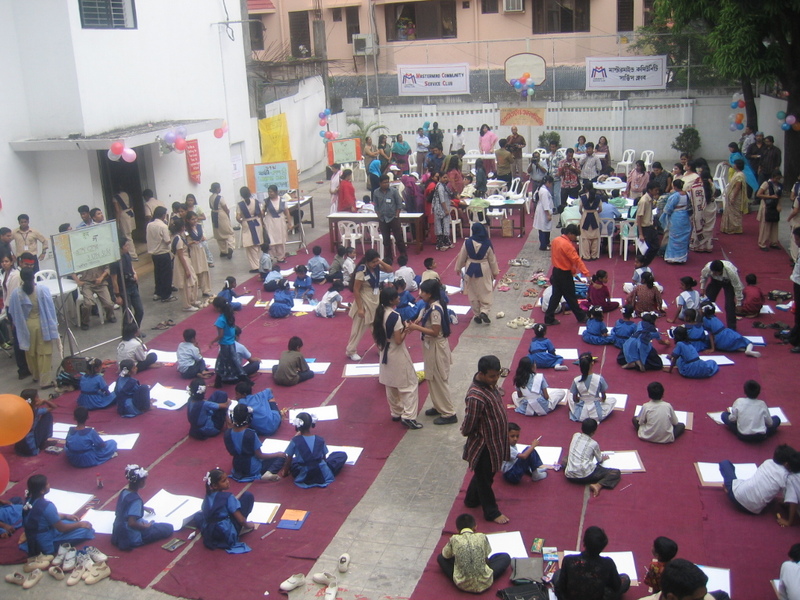 Amongst all its current projects, MMCSC Art Competition 2008 will be remembered as one of their biggest events, and hopes to inspire equality of opportunity in the generations to come. As over 400 children poured in from every direction towards the centre of Rabindra Shorobor (Amphitheatre) at Dhanmondi Lake, it seemed to the volunteers (including myself) that they would be uncontrollable. They laughed, scurried all over the place and between them, shared an energetic force unparallel to everything else. They were truly unstoppable. This is what Chikimonkey-Phulkuri Art Competition felt like on that sunny morning of 21st February 2008. Organized by the children’s organization, Phulkuri Aashor in Dhanmondi and sponsored by Chikimonkey, a product from Akij Group; the competition catered to 425 participants from different schools, of which most were aimed at underprivileged and autistic children. They were divided into three groups: Ka (for autistic children), Kha (for Nursery to 3rd Grade) and Ga (4th grade and onwards). The subjects were as follows: Group Ka “Ja Icche Aaki”, Group Kha “Gourobmoy Shahid Minar” and Group Ga “Rashtrobhasha Bangla Chai”. But, beyond the groups, subjects and rules was the enthusiasm the flowed within every individual present at the occasion. In the midst of the paintings, Shandhani was handing out low cost services to the awaiting parents and representatives from different schools. Anyone interested could get blood grouping and screening done at Tk.50 only, and many of the university goers present at the venue decided to step up and donate blood. Of course, pricking needles through their child’s skin wasn’t a very appealing thought to most of the parents, even if it meant knowing the blood group. Many parents even shooed us away with angry looks and shocked expressions! After an hour of drawing, scribbling and criticizing, the announcer finally ended the competition. The volunteers walked between the rows, collecting the paintings and opening Chikimonkey sponsored drinks and chips packets for the children. As they posed excitedly for a moment on some of our cameras, the remaining volunteers counted and categorised the paintings. The 2-hour long event officially ended with the much spirited Phulkuri song echoing in everyone’s voices and the surrounding air.